Every Monday now through December 16 I am interviewing other artists and crafters in the hopes of spreading some handmade love and appreciation. The month of October features fiber artists. 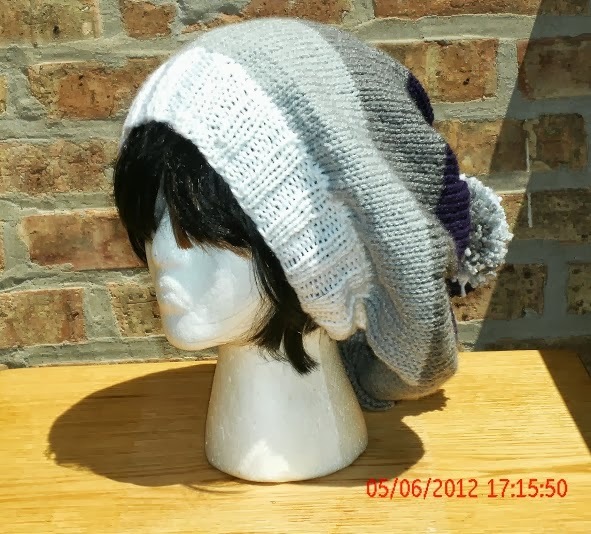 Aside from the name connection, I also really liked Beverly’s work, which features knit accessories that she describes as “a little color and a whole lot of fun.” (I particularly her slouchy hats pictured below!) I am so happy to welcome her on my blog today. How did you get started knitting and crocheting? I learned how to knit and crochet in grade school. A classmate taught a bunch of us. We didn’t have knitting needles or crochet hooks so we learned on pencils. I was fascinated. My mother didn’t have any yarn but she did have crochet thread – don’t know why she didn’t know how to do either, but I knit and crocheted with it until it was almost used up and then undid it so I could start over. Then my sister bought me some needles and yarn and I was off to the races. I used to have a not-for-profit business called Designbcb because I designed other NFP logos, graphics etc. When I decided to open the Etsy shop, it just seemed right to keep the name though it is no longer a not-for-profit name. The blessing and the challenge is the same: it’s mine. I can ask and seek advice but at the end of the day, I have to make the decisions about what to make, how to price it, where and how to promote it. On the other hand, I don’t have a boss trying to make me conform to whatever business model is currently in place. And my commute is only ten seconds. I can honestly say that my creativity is a spiritual gift. There are three aspects to it: I can write, I can sing and I can knit/crochet. I can’t draw worth a darn, can’t do paint by numbers or work with clay. I am inspired to create because it’s a way of saying ‘thank you’ for knowing I have gifts and talents and can use them in ways that fulfill my life and can also be useful to other people. Handmade lotions. They smell soooooooo good and are thicker and creamier than store bought. Can’t go back to store bought lotions. When you are not knitting or crocheting, what do you like to do with your time? A lot of my ‘down’ time has to do with knitting and crochet. I founded a knitting group that has almost 200 members and some of us spend time together outside of knitting and crochet. I like reading, writing, I love detective dramas – especially English ones. Netflix is my new best friend. My husband I visit a different major league baseball park every year – but only when the Cubs are playing. I’m shy. I have to confront it. I’ve done community theatre, I’ve even preached sermons and run a worship service and sang at weddings and I do it mostly because it scares me to death to be so exposed. Plan your work then work your plan. ‘Field of Dreams’ is a movie. It wasn’t until I started taking my business seriously that things started selling. Even with friends and family who know I have a shop, I have to remind them this a business and that I’m not just ‘obsessed with knitting’ as some of them have said. If you’re selling on line, it isn’t the same as having a brick and mortar store. There are HTML rules and algorithms that determine what your site host does. Unless you have your own website and are doing all that yourself, there are things you can’t control. Learn to pick your fights and then learn how to fight them. I am nowhere near as successful as I want to be but I am miles away from where I was and that takes more time than I thought it would but it keeps me from having to look at job wanted ads and I get to live with the blessings every single day. That makes it worth it. 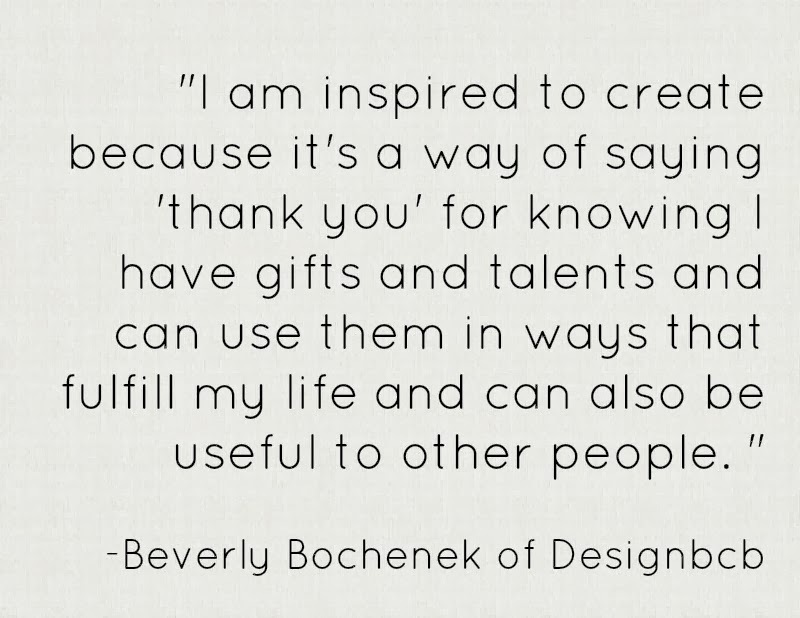 Thanks for joining me on my blog, Beverly, and be sure to check out her shop! Very cool hats!! I am loving your interviews! 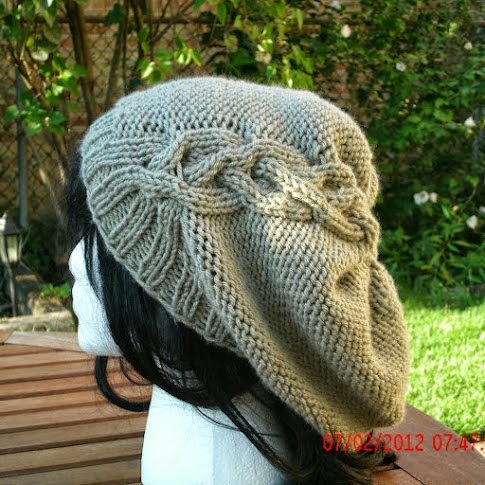 I love a slouchy hat! And I love the name Beverly. That’s one of my daughter’s teacher’s names. Her last paragraph is me to a “T” right now professionally. I’m miles away from where I want to be, but miles past where I’ve been. hey bev! thank you so much for the interview and thanks for the compliments everyone!